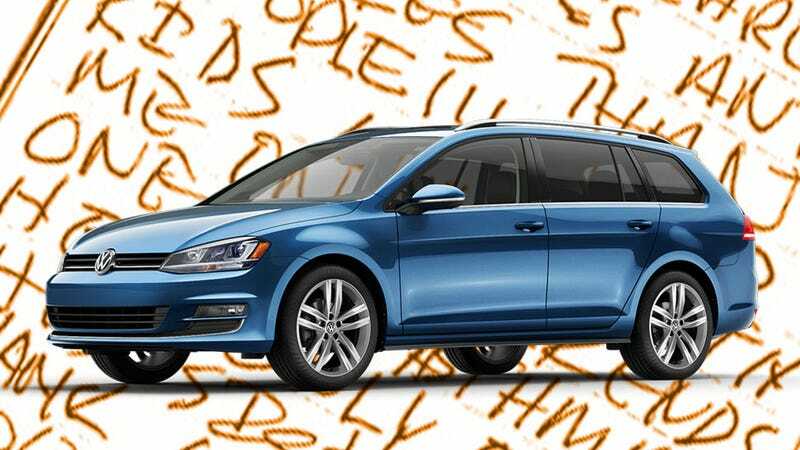 Ever since Volkswagen was found to be cheating on their diesel emissions, the global community of self-righteous, emotionally unbalanced individuals have been delighted, since now they can concoct “justifications” for nasty-note leaving on diesel VWs all over the world. It’s like Dickhead Christmas! Instead of seething and quietly muttering while desperately hoping someone nearby will commit some mild transgression of some sort so they can lay into them in erection-inducing self-righteous wrath, raging jackasses now have a new option. They simply need to locate a VW that burns diesel, and then they can place livid notes on the car, which feels great. I CAN TELL YOUR [sic] A[sic] ISLAMOBAMA DINGBAT YOUR VW STATION WAGON PARKED ON MY STREET IS ONE OF THOSE “GREEN DIESELS” WELL JUST LIKE THE OBAMA-NAZIS, ITS [sic] A LIE AND SHOWS YOU CARE MORE FOR TREES AND WHALES THAN PEOPLE!!! MY 2 KIDS LIVE WITH ME ON WEEKENDS ONE HAS ASTHMA! HES [sic] ONLY 5 AND HIS SISTER IS 2 THANK GOD SHES [sic] OK NOW. MOVE YOUR CAR OR I’LL LEAVE SOMETHING SWEET IN IT FOR YOU!!! Wow. The golf stationery really makes it, too. You can almost picture the beet-red face, the ball-point pen engraving the surface of the table below the note with the force of every stroke, the flying spittle, the wild eyes. All over a person he’s never met, because of assumptions about the car they drive. Also, if he’s upset his kid has asthma, wouldn’t he be in favor of people who were choosing ‘green’ technologies? Is he mad because the car isn’t as environmentally friendly as thought? Based on the rest of the note, the guy doesn’t seem to like the idea of what he thinks environmentally-conscious people — sorry, I mean tree-and-whale-lovers — are, and now he’s mad at the TDI dude because the car in’t actually green enough? You can’t have it both ways, rageling. Also, “leave something sweet?” Is that a sugar-in-the-fuel-tank threat? Or is he going to chug a gallon of maple syrup and take a crap on the hood? Clearly, this guy is not a stable man, and I suspect those kids look forward to the weekends less than many of their little pals. But there’s some good lessons here — we associate cars very strongly with people’s identities and, more importantly, don’t blame a car’s owner for a company’s sins. If I was the TDI owner, I wouldn’t worry too much. I’m sure if he just temporarily sticks one of those ‘Coexist’ bumper stickers on his car, the note-writer’s head will just explode in a fireball of hate and rage.